Peak Hour Pro: Peak Rewards for Peak Performance! 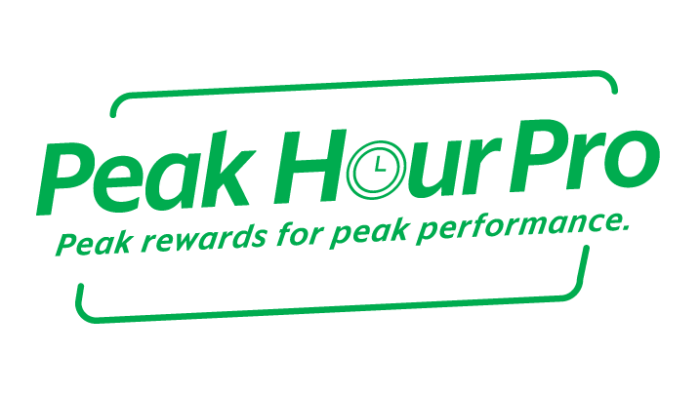 Introducing Peak Hour Pro – a reward scheme that gives you a cash bonus for each trip you drive during boosted hours! 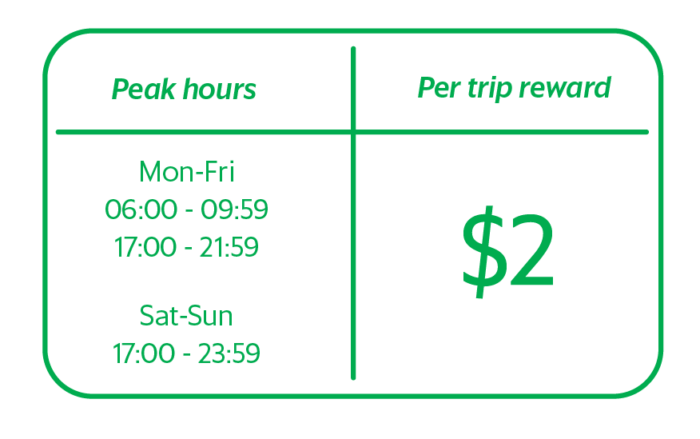 We know your time is each trip is valuable, so we’re letting you earn more per trip! Why choose Peak Hour Pro? Exclusive offer: Be the first 500 driver partners to opt-in for Peak Hour Pro! Enjoy a $2 cash reward for every tip you drive during the boosted hours! No minimum trip fare, no minimum distance, receive a bonus $2 for every trip! Example 1: If Mr Tan earns drives 5 trips between 7am – 9am on Monday, Grab will give him $10 ($2 x 5) on top of the total fares for the trip. So if he earns a total of $50 for the 5 trips, he actually earns $60 ($50+$10) because of the bonus he gets from each trip.Example 2: If Mr Ang drives 12 trips between 5pm-11pm on Saturday, Grab will give him $24 ($2 x 12) on top of the total fares for the trip. So if he earns a total of $120 for the 12 trips, he actually earns $144 ($120+$24) because of the bonus he gets from each trip. There is no minimum trip requirement to receive Peak Hour Pro. To be eligible for this scheme, you must maintain a 90% Acceptance Rate, 15% Cancellation Rate (CR) and 4.3 Driver Rating (DR) each week. For example: Sign up before Wednesday ,11:59PM, on 18 April to receive the programme for the 23- 29 April. Yes. You can opt out before Wednesday 11:59PM of each week and receive your normal trip based incentives instead. This incentive will last from 23 April to 20 May 2018. You only get 1 of the Own Time Own Target Incentives at any given time.You will be given the most recent incentive that you have signed up for. If you decide to opt out any of the incentives under Own Time Own Target, you will have the option to choose another of the 3 options or to receive your normal trip based incentive for the following week.